"We’re very proud of our new branch at the Lone Tree campus and it’s a great example of our commitment to giving people convenient local access to everything Schwab has to offer." 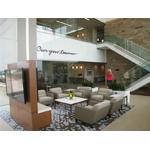 LONE TREE, Colo.--(BUSINESS WIRE)--Charles Schwab, a full-service investment services firm, has opened the doors to a new retail branch location in Lone Tree, Colo. 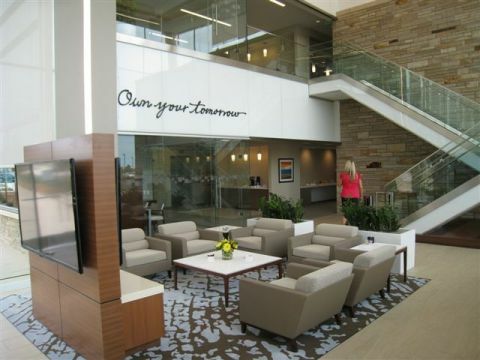 Located at the new Schwab campus being developed in the RidgeGate community at 9899 Schwab Way, it is one of Schwab’s four branch offices in the Denver area and offers access to a full range of investing and personal finance guidance, services and products. The branch, formerly located at the Denver Panorama Center four miles away, officially opened on May 5. The two-story structure is the first building to open at Schwab’s new 40-acre campus. The branch contains approximately 17,000 square feet and 26 offices in addition to a seminar room and adjoining outdoor area. Schwab designed the building for maximum energy efficiency and is seeking LEED Platinum certification. The branch also offers a wide range of educational investing workshops, which are complimentary and open to Schwab clients as well as the general public. Schwab’s Lone Tree branch is managed by Brian Folkerts, CFP®, a Highland Ranch resident who has been with Schwab for more than 20 years. Schwab’s three other Denver-area branches are located downtown at 518 17th Street; in Cherry Creek at 201 Columbine Street, suite #130; and in Boulder at 2480 Canyon Blvd, Bldg M, Suite #M4. To find one of Schwab’s more than 300 branches across the country, visit Schwab’s branch locator. The new branch is a significant milestone in Schwab’s plans to build on its 35-year-long history in Colorado. The company broke ground for its new, 40-acre RidgeGate campus in May 2013. To date, the exterior of the campus’ first two office buildings are 90 percent complete, and construction of the interiors are well under way, on track for completion this fall. A third office building is scheduled for completion in the summer of 2015. Beginning in September, Schwab will begin the process of moving approximately 1,900 of its Denver employees, currently housed in two separate facilities in the Denver Panorama and Inverness centers farther north on I-25, in stages to the new campus. Move-ins will continue into early 2015.